There still is time to order that special Christmas Gift from Promotions and have it in time for Christmas. UEL Flag: Why not a Flag? The flag is 3 feet by 5 feet. The cost is $ 22.00 all taxes included. We'll even ship the flag free of charge as a special Christmas Gift from Promotions UELAC. - UEL Clothing: We have many styles, colours and sizes in stock for you to choose from and there is still time to get it to you for Christmas. Wear the UEL colours with Pride in 2011. - Men: Looking for that gift for the person who is hard to buy for ( also known as the Mrs.) then why not consider the following: UEL Blue Pin, UEL White Pin, Crossed Flag Pin, UEL Blue Pendant, or a pair of UEL Blue Pendant Earrings. And if you really want to please her, go that extra mile and purchase a Red, White and Blue Ribbon for 0.50 cents or purchase 2 Ribbons for $ 1.00 and we will include 1 additional Ribbon free. Now that`s what you call getting into the Christmas spirit. - Ladies: Looking for some small item as a Special Gift for that other hard to buy for person? Consider a License Plate Frame or a Car Decal, or a set of Coasters with the Crossed Flags. Or perhaps a Ball Cap for the times he moves from in front of the TV and goes outside to visit his friends at the local Tim�s. - Black Valise: With the UEL Flag embroidered on the front. The valise comes with a carrying handle and a shoulder strap. It has a clear plastic window for your name or business card. Cost is $ 24.00 all taxes included, shipping is additional. When you are thinking of Gifts for Christmas consider Promotions UELAC. Check-out the listed items - and many others - on the Promotions on-line Catalogue. For approximately a century, from the mid-1800s until the mid-1900s, railroads were king in Brockville since they were the community�s largest employer. But the town was not unique in this aspect since the coming of trains shaped the development of the entire country. Brockville�s location was the prime reason for the extensive railroad industry here. It was among those communities located at a strategic point on the all-important rail corridor between Canada�s two largest cities � Toronto and Montreal. Railroading came to Brockville through the Grand Trunk Railway System. Established in 1852, the Grand Trunk was so named because it was intended to be the main rail line through southeastern Canada with secondary or trunk lines branching out from it. It had its headquarters in Montreal but its corporate headquarters and financial backers were in London, England. With the growth of burgeoning trade between Toronto and Montreal, Grand Trunk Railway officials realized there was a pressing need to construct a railroad between the two communities. In 1855, the Grand Trunk line was extended through Brockville which was selected as the railroad�s first division point. Located a little over 100 miles from Montreal, the division point at Brockville was a train service centre. At the Brockville division point, the era�s steam locomotives hauling the trains needed to refuel with wood (later coal) as well as take on water for boilers and sand used for traction. And more often than not, the locomotives needed minor repairs. Extensive workshops, switching yards and related services developed at division points where train crews would also be changed. Brockville was home for many members of train crews including engineers, firemen, conductors and brakemen. It also gave employment for workers in the repair shops, operating the coal chutes, cleaning out the ash pits from locomotive fireboxes and transferring goods in the freight sheds. Other railroad employees included dispatchers, clerks and supervisors. Two more developments helped the growth of railroads here. In 1859, the Brockville and Ottawa Railway extended a rail line from Smiths Falls to Brockville. That route linked with a rail line to Ottawa and the rich timber resources along the Ottawa River. The following year, the Brockville Railroad Tunnel was opened providing easy access to the community�s waterfront. Here, the Brockville and Ottawa Railroad built a large rail and dock terminal. Timber from the Ottawa River valley was shipped by rail to Brockville and transferred onto ships bound for ports around the Great Lakes and Great Britain. Brockville�s third railroad � the Brockville, Westport and Sault Ste. Marie Railroad � was established here in 1886. It was the intention of developers to extend the rail line to the northern Ontario community of Sault Ste. Marie but granite rock caused construction costs to soar and the line went no further than Westport about 35 miles northwest of Brockville. The three rail companies once dominate in Brockville have disappeared although passenger trains still stop here. The Brockville and Ottawa Railroad amalgamated with the Canada Central Railroad in 1878 which was subsequently absorbed by the Canadian Pacific Railroad in 1881. The Brockville, Westport and Sault Ste. Marie Railroad ceased operation in 1952. The once-dominant Grand Trunk Railroad fell on hard economic times after the First World War and in 1923 was absorbed by the government-operated Canadian National Railroad. Brockville�s dominance as a rail centre declined in the 1950s with the advent of diesel-electric locomotives which travel between Montreal and Toronto before needing to stop for fuel or maintenance. 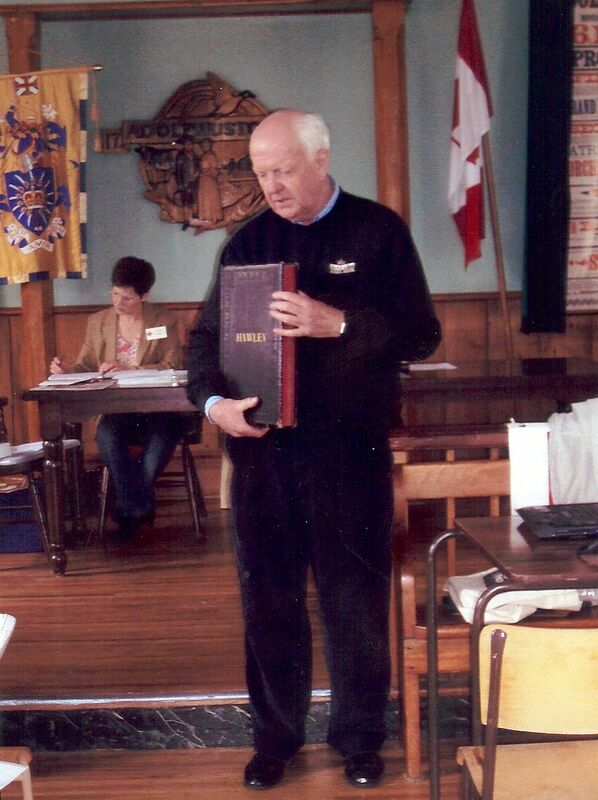 The third of a series of articles describing interesting historical facts about Brockville and the surrounding region of the St. Lawrence River and the 1000 Islands where Conference 2011 "Catch The Spirit" of our Loyalists� Ancestors will be held. Hosted by the Col. Edward Jessup Branch, the United Empire Loyalists� Association of Canada�s annual Conference will be held from June 2 to 5. Of all the categories of loyalists, those who could be described as "boomerang" loyalists are perhaps the most misunderstood. Loyal Americans who fought for their king and died before the end of the Revolution are seen as heroes. Those who survived the loyalist soldier's life or who maintained their loyalty in the face of persecution are seen as virtuous. Those colonists who stayed true to the British Empire after the Declaration of Independence, but decided to remain in the United States after 1783 were also loyalists, but their political convictions have generally been forgotten by their descendants. But what are we to make of those Americans who endured harassment throughout the Revolution, suffered banishment by patriot neighbours, received compensation from the British government for their losses and then decided to return to the United States? Here is the first of three stories about such "boomerang" loyalists. What is immediately noteworthy about Isaac Wilkins is that in reading his wartime experiences, one cannot imagine that he would even consider a return to the United States. He began life in Jamaica as the son of a Welsh plantation owner. Wilkins was sent to New York to receive an education, graduating with a master�s degree from King's College in 1763. A year earlier he had married Isabella Morris; the couple would eventually have twelve children. Although he had originally intended to become an Anglican minister, Wilkins entered colonial politics. In 1775 he was the representative in the New York House of Assembly for Westchester. In Sabine's words, "Mr. Wilkins's zeal and extreme loyalty rendered him very obnoxious to the Whigs." He not only spoke up for his king, but he also published pamphlets showing the fallacy of the rebels' arguments. Failing to capture Wilkins, patriots tarred copies of his "The Congress Canvassed" instead, coating it with turkey feathers. They claimed that the plumage of this bird was the "most stinking fowl in creation". Wilkins' book was then nailed to a whipping post and set on fire. Seeing such violent opposition to his loyalty, Wilkins sought refuge in England in May of 1775. His last speech to the members of the House of Assembly included these words: "May Great Britain and America be soon united in the bonds of everlasting unity; and when united, may they continue a free, a virtuous, and happy nation to the end of time. I leave America, and every endearing connection, because I will not raise my hand against my sovereign, nor will I draw my sword against my country; when I can conscientiously draw it in her favor, my life will be cheerfully devoted to her service." Wilkins left his wife and children at their home in Morrisiana, New York. Some feel that during his time in England, Wilkins tried to work out an amicable settlement between the British government and the colonies. When he returned to Long Island with General William Howe in the summer of 1776, his patriot neighbours were so enraged that they attacked and plundered his home in Westchester. Isabella and the children managed to escape with little more than the clothes they were wearing. After patriots ransacked the Wilkins' home, it was further damaged by British and Hessian troops. One thousand acres of woodland had also been destroyed. At the end of the Revolution, Wilkins was one of the few loyal Americans who was allowed to sell his estate according to the Articles of Peace. Most New York loyalists simply had their property seized by vengeful patriots. After moving to Shelburne, Nova Scotia, Isaac Wilkins was appointed the first judge of the court of common pleas. On December 13, 1784, Wilkins appeared before the Halifax sitting of the loyalist claims board to seek compensation for all of his losses. These included 50 sheep, 30 hogs, 32 cattle, and six horses in addition to �300 work of crops, �100 worth of implements, and �500 worth of furniture and clothes. His quick escape to England in the spring of 1775 cost him �400, but he only asked for half of his costs. Whether the three witnesses who spoke on Wilkins behalf helped him to receive all that he asked goes unrecorded. Over the next fourteen years, the Wilkins family moved from Shelburne to Lunenburg. In time, their son Lewis became a member of the Nova Scotia House of Assembly and later a supreme court judge. Although they seemed settled and well-established, Isaac and Isabella did not remain among the loyalists of British North America. In 1798, they returned to Westchester, New York. Wilkins, then 57 years old, was ordained a deacon and, in the following year, became the Episcopalian rector for St. Peter's Church. He held this post until his death in 1830. How did Wilkins change from loyalist legislator to Nova Scotian judge to New York rector? Why did a man of such strong principles return to his republican home? The answer may lie in the words of the epitaph Wilkins composed for his tombstone. It says, in part, "faithful minister of this parish placed here, as he believed, by his Redeemer." Like the reluctant prophet Jonah who was sent to Ninevah, or St. Paul who turned from being a persecutor of Christians to a Christian preacher, it seems that Wilkins felt a divine call to become a clergyman and to serve his God in -- of all places--republican New York. It may be that he was as surprised as his American parishioners that he had become one of the many "boomerang" loyalists. Next week's Loyalist Trails will tell the stories of other loyal refugees who returned to their homes in the United States of America. For those of you interested in reading more of Stephen Davidson's loyalist stories, there is now a new address from which you can purchase his 2007 book, The Burdens of Loyalty: Refugee Tales from the First American Civil War. By contacting , you may purchase the e-book for $6.00. While tracing the story of one Connecticut loyalist family, the book relates the stories of over 100 others who also shared the experience of living in a politically divided town, finding sanctuary in a refugee camp, sailing on the first evacuation ship for New Brunswick and founding a loyalist settlement. The book has been used in the loyalist studies course at the University of New Brunswick and was recently cited in Thomas B. Allen's book Tories: Fighting for the King in the First American Civil War. Allen said: "Stephen Eric Davidson especially helped me understand the pride of present-day Loyalists. His work on the Loyalists past is a model for genealogists, for he adds human details and family stories to the "begat, begat,begat" of traditional genealogies." The parishioners, acting under the Statutes of Nova Scotia, met and elected John Mersereau of New Jersey and Henry Vanderburg of Dutchess County, N.Y., as Church Wardens, and Messrs. George Harding, William Hubbard, Nathaniel Underhill, Elijah Miles, John Simonson, Joseph Clarke, M.D., and William Van Allen, Vestrymen. The majority of the Vestry were half-pay officers who had served in the Loyalist Regiments during the late war. The election of the first church corporations in Kingston and in Maugerville ante-dates the organization of the Province of New Brunswick. Governor Carleton did not arrive from England until the 20th of November, 1784. His commission, announcing the erection of New Brunswick into a new Province, was published two days later. The formation of a church corporation at Maugerville on Sept. 29th, 1784, was not the first in the province, one had already been formed in Kingston on May 10, 1784. Henry Vanderburgh [sic], who was one of the first Wardens in Maugerville, and also his son Capt. Richard Vanderburgh, came from Dutchess County. They were, I suppose, old parishioners of Rev. Mr. Beardsley. The father Henry arrived in Maugerville in October, 1783, and the son Richard was elected, at the first New Brunswick provincial election (in November, 1785) a member for Sunbury County in the House of assembly. Both of the Vanderburghs returned, not many years later, to the United States, but their presence in Maugerville may have been among the attractions that helped to induce Mr. Beardsley to remove there in 1786. Several years ago when I started my genealogical research I discovered the Society of the Hawley Family Inc. This organization was founded in 1923 in Stratford Connecticut. Their current genealogist Trudy Hawley helped me immensely in tracing my ancestors back to Joseph Hawley who arrived in America around the year 1634. In October of 2009 I attended the 79th annual Hawley family reunion which was held in Rochester, New York. Part of the reunion included a trip to the Rochester library where I first saw what is called the Hawley Record. The book was compiled by Elias Sill Hawley who was born in 1812 and died in 1897. He spent 45 years of his life doing genealogical research on the Hawleys in America. I expressed to Michael Hawley the president of the Hawley Society how dearly I would love to acquire a copy of the Hawley Record. Michael told me there were only 300 copies published in 1890 so my chances of getting one were remote at best. I asked Michael to call me if one ever became available. At the 2009 reunion Michael Hawley had indicated to me that he was a descendant of a Loyalist so I asked him if he would be interested in getting his certification. He thought that would be fantastic and we agreed that we would work together on compiling the required proofs. Michael would work the American side and me the Canadian side. My intention was to present his certificate to him at the 80th annual reunion that was scheduled for October 2010. As the summer wore on we were making some progress but as we were both very busy it was slow progress. By late August with the help of Linda Corupe, Peter and Angela Johnson we had everything needed to prove that Michael�s Loyalist connection was to Sheldon Hawley. It was then that we realized that Sheldon Hawley was the son of Jeptha Hawley who was also a United Empire Loyalist as was his father Jehiel Hawley. The research got a bit crazy when we realized that Michael qualified for what I believe is rare in that he had three loyalist connections in a straight line. With the October reunion deadline looming we pulled out all stops on getting the remaining proofs together. We managed to get everything submitted to Toronto by early September and the certificates were approved and mailed to our National President for his signature. Then the post office caused a major problem by taking about ten days to deliver the documents from Toronto to Oakville. Our National President Mr. Fred Hayward, UE saved the day by personally delivering the certificates to my home in Colborne, Ontario two days before my scheduled flight to Cincinnati. On Saturday afternoon at the Hawley Society annual general meeting and dressed in my 1784 Loyalist attire I presented the certificates to Michael Hawley. Only Michael and I knew what was going to happen so there was quite a stir when I entered the room dressed in a red waistcoat, tricorn hat, buckle shoes and the three certificates carried safely in my haversack. After the presentation to Michael I also conducted a brief presentation about the UEL Association of Canada and our Bay of Quinte Branch. I used both our websites and the Fife & Drum website for the visual part of the presentation. I also shared with them a bit about the events that are planned in Ontario from 2012 through 2014. I was asked if I would consider hosting the 2012 Hawley Family Annual Reunion. I agreed to take it under consideration. I am absolutely amazed at all that has happened and the many friends and relatives I have discovered since starting my research four years ago. If you are a paid-up 2010 member of a branch, you should receive soon if you have not already the Fall Gazette. They were mailed mid-week around Nov 24 and the extra copies delivered to Dominion Office on Nov 24. The Archives of Ontario is pleased to announce that the microfilm of the 2009 accrual of Vital Statistics records from the Office of the Registrar General, comprising the 1913 birth, 1928 marriage, and 1938 death indexes and registrations, will be released to the public on Wednesday, December 1st. Consisting of over 127,000 scanned images, the microfilm and its related finding aids will be available, both at our Reading Room at 134 Ian Macdonald Boulevard in Toronto, Ontario, on York University's Keele Street campus, and at your local library through our Interloan program. On that same morning, the Vital Statistics listings on our website will be updated to include the new reels. As the Genealogical Society of Utah is no longer involved in the copying of Ontario's Vital Statistics records; the microfilm will only be available at or through the Archives of Ontario. In the meantime, the 2010 accrual of Vital Statistics records, consisting of the 1914 birth, 1929 marriage, and 1939 death indexes and registrations, are currently being scanned and the resulting 130,000 images checked for clarity and completeness. As the Archives embarks on making archival records accessible through the Internet, we are working to have these records available online in a searchable format in 2011. We will also be striving to make the April 2011 accrual of the 1915 birth, 1930 marriage, and 1940 death registrations available later in the same year. As the work progresses, further details will be released through this website. I was talking to the librarian in Lindsay yesterday and she said Ancestry was not going to digitize any further BMDs than they already have posted for Ontario, so the Archives are going to do it and put them on line for free. On Oct. 21, 2010, the Honourable James Moore, Minister of Canadian Heritage and Official Languages, announced that Canada will now officially recognize April 6 as Tartan Day. "A tartan represents a clan, a family, and a community, and is an enduring symbol of Scotland that is cherished by Canadians of Scottish ancestry," said Minister Moore. "Many Canadian provinces and other countries already celebrate Tartan Day. As well, through Tartan Day, Canadians will have an opportunity to learn more about the various cultures that comprise Canadian society." Tartan Day originated in the late 1980s in Nova Scotia, where it was declared an official day by the provincial government. It then spread across the country, with many provinces joining in. This marks the first time the Day has been recognized by the federal government. "By officially recognizing this Day, we encourage Canadians all across the country to celebrate the contributions that over four million Canadians of Scottish heritage continue to make to the foundation of our country," said Senator John Wallace, who recently introduced a bill in the Senate in support of nationally declaring Tartan Day. In Canada, Tartan Day is celebrated on April 6, the anniversary of the Declaration of Arbroath, the Scottish declaration of independence. Tartan Day celebrations typically include parades of pipe bands, Highland dancing and sports, and other Scottish-themed events. Let me start this article off with the warning, �This is not a hoax!� Have I got your attention yet? I have heard the lamentations a number of times regarding the uncaring advancement of technology. What happened to all those wonderful (manual) word processors (typewriters) that we used for our correspondence? Well, some were used as anchors for rowboats, some found hiding places in closets, and others, well, they found a home with this company. Yes, believe it or not, you can still purchase a Royal typewriter, and this model is able to take the place of your computer keyboard. What a picture this brings to mind. These typewriters have been modified so that they plug into a usb connector on a computer and function just like the venerable old typewriter, but instead of having paper in the platen, the words fill your computer screen; word processing programs, email, etc. Paper can still be inserted into the platen if a hard copy of what you are typing is needed. Those of you who miss that distinctive clackity clack of the typewriter keys striking the ribbon and paper can have it all back. No longer will you be able to sneak off into a corner and catch up on emails without disturbing someone watching television. You will even have that distinctive �whir-clunk� as you use hit the carriage return. If special characters such as F1, esc, ctrl, Caps Lock, etc. are important to you, they will be available with a special toggle key. I hope that your pocket book is willing to support your trip to nostalgia land because a converted typewriter will cost just under a thousand Canadian dollars. If your tastes run more towards a Smith Corona or Remington model, these are available also. For those intrepid few who want a challenge, there are kits available; check out their site. These cost a shade over $60.00 Canadian. The kits come with everything you will need such as 2 blank PCBs, all electronic parts, and detailed instructions to convert your own typewriter into a �Retro Keyboard�. You will have to supply soldering irons, pliers, tweezers, hot glue gun, wire, etc. If you think that this would be a worthwhile challenge, a disclaimer suggests that intermediate soldering skills would be required. The manufacturer said that he cannot debug a project that does not run properly. Since all typewriters are somewhat different, some ingenuity may be required to get all parts working as they should. The site claims that it would take an experienced solderer 3 to 4 hours assembling the electronic components. Another 3 hours would be required to install these parts onto your typewriter.. I thought it interesting that the website mentioned in bold print that this usb typewriter will also work on your iPad. It seems to me that if you were going for the smart techie sort of image, you would lose something if you also had to tote around a portable typewriter with you. All in all, a project like this would really be a conversation piece, particularly if you got it working. I am sure that the Eco crowd would laud your efforts in keeping old typewriters out of the landfill. Last but not least, this might be a real fun project that would bring many grins and great pleasure. Alas, my wife said �No�. You can email Wayne Scott to get in touch with questions or comments. "Chloe OLNEY was born 1746 in Washington, Rhode Island, and died WFT Est 1764-1840. She married Jesse LEWIS 1772 in Parrsboro, Cumberland, Nova Scotia. He was born ABT 1750, and died WFT Est 1767-1841." This article states that Jesse was born about 1750, which would make him about 22 years old when he was married, not twelve. Those who give Jesse�s birth as 1760 are probably making their best guess. Hopefully I will be able to determine his real birth date; with luck when I visit Washington Rhode Island. Vital Statistics and is reported by his grandson as his son had died one year earlier. My assumption at the moment is that the 1760 birth date is probably correct and the marriage date incorrect. As to the use of the name Parrsboro,originally Parrsborough, which was named in honor of Govenor Parr of Nova Scotia in 1784. Prior to that the area was called Halfway River. Like my hometown of Hantsport on the Avon River, which was also known as Halfway River until Hantsport was incorporated in 1895, the old name continued to be used for some period after the change. However, it would be better to say that Chloe Olney married Jesse Lewis in Halfway River in 1772, but if the date is incorrect and it was later, then the location would have been Parrsboro. In my original query, I was asking for information about Mary Lewis, my g-grandmother. I have recently verified that her middle name was Elizabeth. On her son Nathan Coldwell�s death report, his wife Mildred refers to Nathan�s mother as Elizabeth Lewis, omitting her first name Mary which is on her death report. I feel I have made considerable progress on sorting out details and correcting inaccuracies in the generally available information about the Lewis family of Halfway River. I realize that some details may never be known for sure and I still hope readers have some pieces of information and sources that can help. I have researched this family, since one of my ancestors married into this Lewis family. Oman Lewis b. 1823 Mills, Cumberland County NS, married as his second wife, Elizabeth Ann Ripley b. 1841 in Fenwick, Cumberland County NS, on 23 April 1865. Oman Lewis was the brother of Mary Lewis (b. Mills 1823) who married Lawrence Coldwell in 1846 at Wolfville, Kings County, Nova Scotia. Myrtle Chappell's excellent book, "Fenwick", is a very helpful resource. There were other children as well. Mary Lewis and Oman Lewis were children of Gaius Lewis, Esquire, a Nova Scotia Member of Parliament. Gaius Lewis was born 09 March 1788; his wife was named Jane Fullerton, who was born 11 March 1795 in Horton, Kings County, Nova Scotia. The Nova Scotia archives will send more information, over a long period of time, if requested. Gaius Lewis was in turn, son of Jesse Lewis and Chloe Olney. Jesse in turn was son of Caleb Lewis, UE, who was born 22 May 1736 in Wethersfield, Hartford, Connecticut, and died in Halfway River, Nova Scotia, on 28 April 1827. Caleb Lewis UE was married to Abigail Moss born 18 August 1740 in Wethersfield; Caleb and Abigail were married 13 March 1760 in Wethersfield CT.
"Caleb Lewis, son of Benjamin Lewis was born at Wallingford, Connecticut, May 22, 1736. He married Abigail Moss on March 13, 1760. Abigail Moss was the daughter of Benjamin and Abigail-Cole Moss. Caleb Lewis apparently refused to take part against the British Crown in the Revolutionary War of the Colonies. Caleb was arrested because of his Tory sympathies. His property was confiscated, his family broken up. Caleb escaped from prison with one John Fordice. He was taken away from the dead body of his wife (reason for death unknown). For eight days these two men lived on roots and berries. On one occasion, hiding in the dense branches of a friendly tree they saw troopers who were searching for them. As the troopers rode by Caleb and John heard them swearing and threatening to shoot the fugitives at sight. They walked through Maine to freedom in Nova Scotia, Canada. Caleb Lewis and John Fordice secured from the government of Nova Scotia a grant of land. The lot contained 85 acres and was described in the deed as lying and being on the road between Partridge Island and Fort Cumberland, extending from the road on one side to Muddy Brook. Caleb Lewis felled the first tree between Partridge Island and Maccan. Caleb Lewis dared not write home to his family as he thus now was an United Empire Loyalist. Five or six years after Caleb and John escaped from prison, Caleb's son Jesse searched out his refugee father. In Sackville, New Brunswick, Canada, Jesse Lewis had heard his refugee father was living near Parrsboro Village, Cumberland County, Nova Scotia, Canada. Jesse Lewis found his father Caleb near Parrsboro. The 85 acres of land was deeded to Jesse. When the Revolutionary War ended, Caleb Lewis and John Fordice returned to the new United States for their families. John Fordice, found that his wife (name unknown), thinking he was dead, had married again. John did not upbraid her. It was her choice to remain with her wealthy husband in his fine home or return with him to frontier hardships. She chose her first love and returned with John Fordice to Nova Scotia, Canada. John took back with him his two unmarried daughters named Lois and Martha. Lois afterwards married Daniel Holmes of Half Way River. Caleb Lewis returned to Nova Scotia, and died April 28, 1827." Not all of the above narrative has been 100% verified, but I believe that it is reliable. I have a copy of a certificate application that the applicant would like to contribute to the Loyalist Directory. If someone would transcribe the scanned data into the Word version of the application, it would be much appreciated - contact the editor.